In a week of lots of extra requests and tasks, I want to tell you about today, which was possibly one of the busiest days this year. However, I was blessed to have had a volunteer arrive for the week. 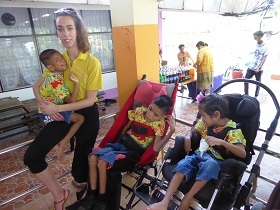 Liz, who was formerly a volunteer for the Huahin holiday last August and who looked after Mr G, came back to see us and volunteered some time in her school holidays. Liz is a teacher of 6-year-olds in a UK school. Her love for our kids was sparked on her previous visit and she felt it was worth flying over here again even for just a short time. Liz arrived on Sunday evening and started with the kids and me on Monday with a semi-normal day, although it was technically a Bank Holiday. Tuesday was with the kids in the morning and then lots of prep tasks in the afternoon. 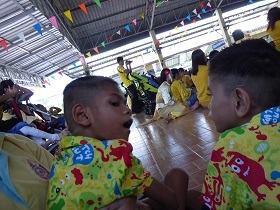 Wednesday was the orphanage’s Songkran festival. This is when Thai people celebrate the Thai New Year by blessing their elders and having water fights in the streets. The orphanage kick this off with a parade down the main drive of the home from one spirit house to the next. It ends at the big open-air room where the official opening ceremony takes place, dances are performed, followed by the teachers who do a great job of teaching the children about the festival and showing them big photos of last year’s event. We had Mr B, Miss A and Mr G with us and then there were about five other children from our ward amongst the many from different wards. Mr G was not keen to stay sitting as he was in a big chair which was not comfortable. Miss A was comfortable although she was hot. Mr B was well behaved. We headed back after the festival and gave them all a rest. 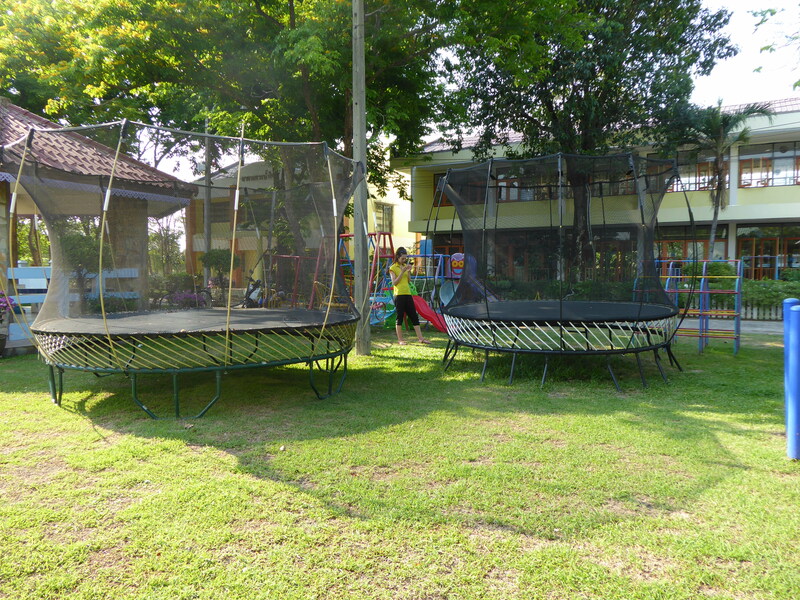 A springless trampoline had been offered for a good price on the local Facebook site. I had thought the orphanage across from Bann Feung Fah might like it: they were not keen, but Bann Feung Fah were. Usually costing 83000 new, we got it for just 13000 second hand. I understood it to possibly be slightly bigger than the one we had, but boy was I wrong. After many messages and calls today and yesterday, we understood it was arriving at about 1.30. In the meantime we got some other tasks done. What else was there to do? Eat lunch, treat one of the children’s legs with his every other day soak and wrap, search for the last two chairs we needed for the trip, try to get transport for the repaired sensory room castle to be returned from the shop, check on my kids, including Miss K’s brace and nappy, Miss A’s temperature and Mr C (after his return from sick ward stay). As we get close to the estimated time for the trampoline, I get a call to the office. An adoptee and Dad from years back have arrived. I had been speaking with this young man on and off as I’d been assisting with his case when he was still at the home. I’d received care packages to take to the home, so contact with parents was strengthened. The visit was a great one with his Thai so strong. He said afterwards in Facebook chat ‘Get to meet people who takes care of me again’. When asked if the day had gone well, he said it had been ‘a lot of fun’. As the family were meeting staff from the past, one after another remembering each other, I got a call to say that the trampoline was being driven in the gate and, wow, it was hard to miss. The place we wanted to put it, right outside the older children’s ward was not possible, as there was no way to get it under the walkway to the grass. It ended up having to be placed next to the smaller one. The driver and shipping team got it off the truck and rolled it into place and put up the nets. It was huge! I had underestimated its size. It really, really was worth the money. We headed back to my ward to join in the second part of the Songkran festival (which has always been the most fun part for the children). 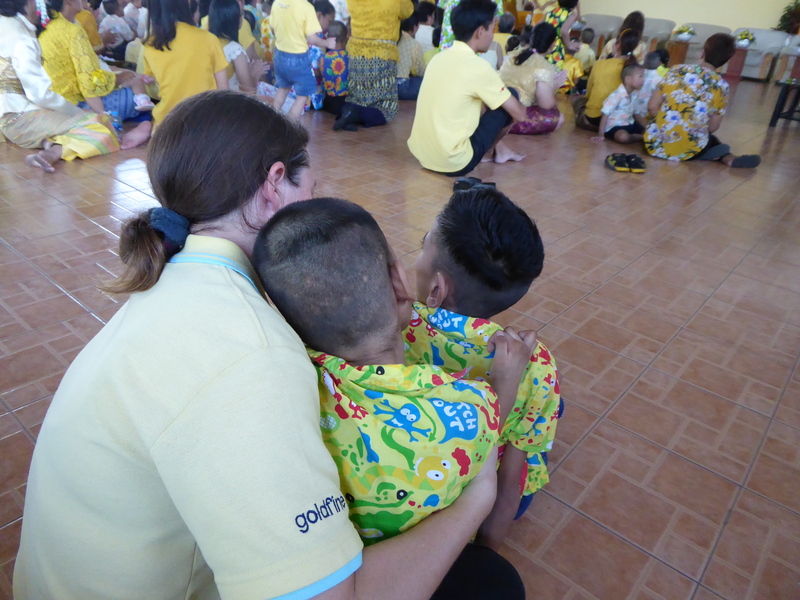 They first start with some silly games, similar to those in the UK but with a Thai twist… ‘Duck duck goose’, but more like ‘Teddy bear teddy bear drop’ and then the snake family game, which is like ‘In and out the dusty bluebells’, where you try to get more people on your side. 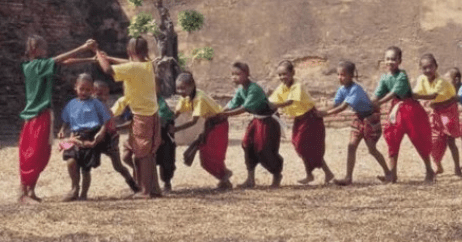 In this instance, Daddy snake is trying to catch the babies, but the mummy snake protects them, and finally the hobby horse game, but the horses are made of palm tree leaves with bent stems for the head. 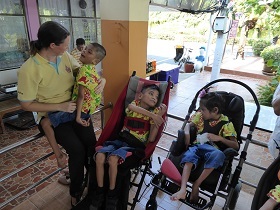 Then the children with physical difficulties get to go over to the erected pool to start the Songkran fun. Liz had not really realised how wet, wet can really be, but this was highly welcome as the heat on this day was really hard to bear. The water in the pool had been warmed up in the sun. For this part of the celebration, we brought Miss N and a child from the ward who I have traditionally taken to Songkran as an extra. With little scooping buckets and water guns, we proceeded to get all those around us wet and got wet in the process. Water flew in every direction and the children squealed and laughed with delight. 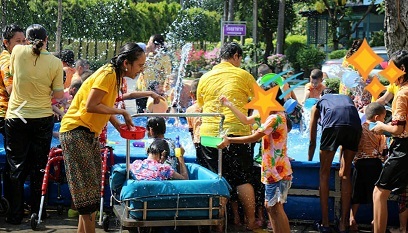 Staff and children had fun together with the water. We took Miss N and the ward child back for a shower and had a little further play in the bathroom as we did so. We got them showered and rested up back on the mats ready for a meal. We found the final wheelchair that was needed for Mr G and sorted out straps and pillows for better positioning for him. We put the wet strollers out in the hot sand to dry and went back to the trampoline to give the mat a sweep and mop. A quick jump and back to the office. We confirmed the trip for Thursday was ok and headed to tidy up. Managing it all in the head, we barely had the energy to cycle home and shower before chilling out on our beds for a while before getting food. It was a great, but mentally draining, day which is a real blessing. God bless you all. So glad to hear that you all had a wonderful day even though it was tiring with so much happening. Hope the trip went well and everybody had fun.